Oxfordshire, 1947. Exhausted by the war and nursing a tragic secret, Kit Smallwood flees to Wickam Farm to recuperate. There she throws herself into helping set up a charity sending midwives to India - and she also meets Tomas, a handsome, complicated, and charming Indian trainee doctor nearing the end of his English education, she falls utterly in love. Tomas makes her laugh and marriage should be the easiest thing in the world. But when he informs his family that he is shortly to return home with an English bride, his parents are appalled. Despite being Anglo-Indian herself, Kit's own mother is equally horrified. She has spent most of her life trying to erase a painful past and the problems of her mixed-race heritage - losing her daughter to an Indian man is her worst fear realised. 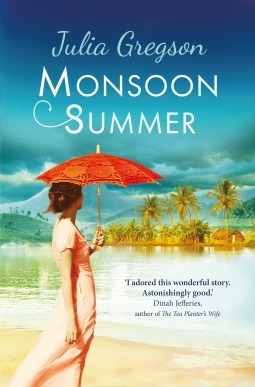 As she and Tomas journey to a new life in India, Kit begins to realise the seriousness of what she has undertaken. Thrown into the heart of a traditional Indian family in a rapidly changing world, she has much to learn about the nature of home, and about the depth of her love for Tomas. It doesn’t help that with newly-acquired Independence, many of India's people furiously resent the English for withdrawing so quickly, blaming them for the riots that have left millions dead. Julia Gregson’s earlier novel, East of the Sun, was a bestseller in the UK, where it was Romantic Novel of the Year in 2009. Details: Monsoon Summer is published today in hardback and ebook by Orion Fiction. Priced in local currencies. Available also as an audio download.